Dee was brought up in South Africa, a country rich in vivid natural beauty which is reflected in her work. Her Jewellery echoes the unity of colour, patterns and shapes within nature. Particular exploration into the texture and feel of pieces gives each design an opportunity to be individual and subltly different from the next. 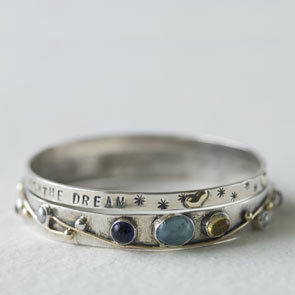 Dee's use of silver, gold and semi-precious stones utilises organic forms throughout the whole range of jewellery. With consistent inspiration the range is continually evolving and harnessing new forms of nature and art into her designs.